Well, besides eating out. We tried to catch up on all the little chores that end up being neglected when you are gone for 2 weeks. I think I might be there. I haven't done much of anything else but pick up the house and try to keep the kids from destroying it again. I have one more load of laundry and I think I may be caught up on my sleep. Not really sure yet. Still tired but that may be from sleeping too much. 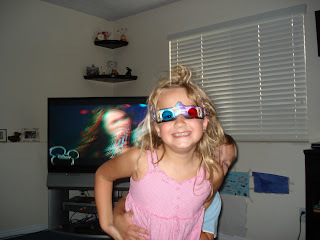 Besides all of that we saw the Hannah Montana concert in 3D! !I know you are all so very jealous. So glad that the concert was on TV and I could watch it in the comfort of my own home. We cranked up the TV to make it loud like a real concert and gave the kids root beer and popcorn. They loved the music but it got annoying taking off the 3D glasses when they had those special clips. 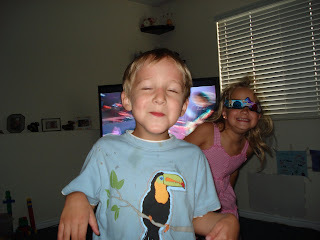 Here are some pics of the kids dancing around.